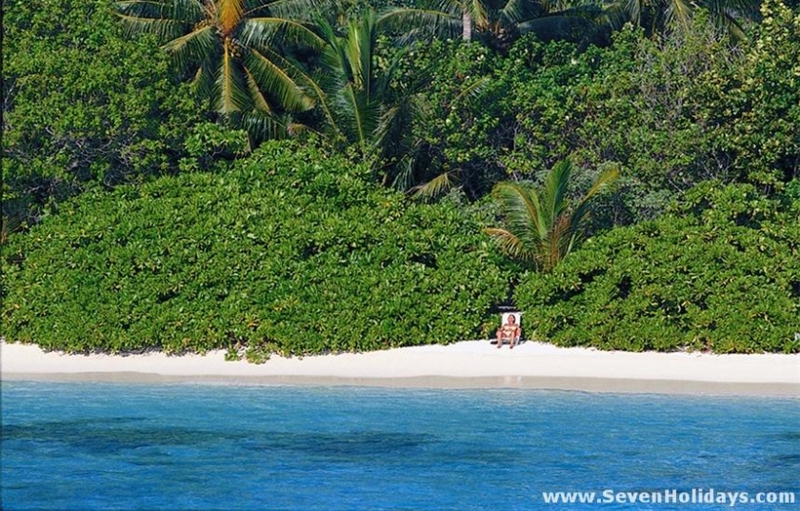 Bandos has long been a popular choice for an active, pro-family resort close to Male, with good snorkeling and diving . The look and feel is a balance between the formal and the casual. This balance is symbolised by the thatched roofs on every building contrasting with the tiles on every floor. It is an informal island but not always barefoot. 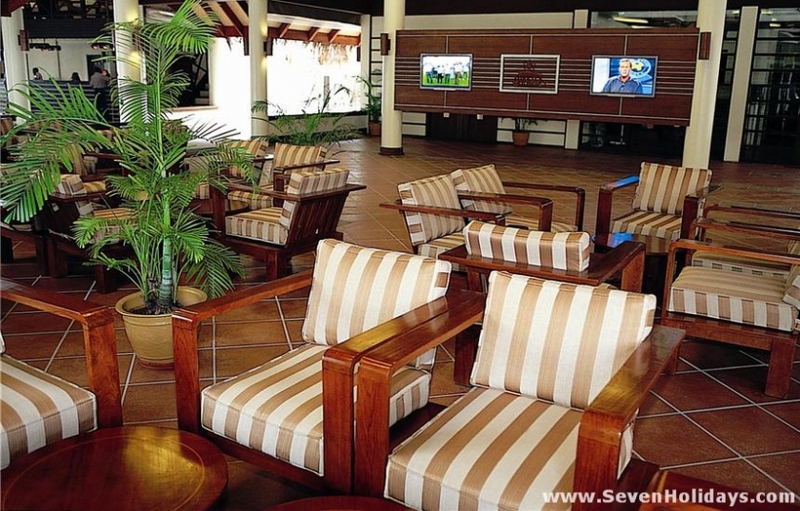 It has an internet hotspot and large plasma tv, as well as a conference hall, near to the reception, but it still has its tranquil verandas, tall palms and pockets of private beach . Families are not just welcome here but catered for. In the interior is a large sports centre with tennis, badminton, squash, table tennis, gym and table games, as well as massage, sauna and steam rooms. For the much younger children there is a childcare room with appropriate toys and an outdoor play area. Female staff members are on hand to look after the children and are available for babysitting in the evenings. There is good shade at the water’s edge, which is essential, but many rooms don’t have much beach and the lagoon tends to deepen quite quickly. Children who are neither very young nor old enough for the big games might well find other children around to play with, as this is one of the largest resort islands in terms of size and number of rooms. Some rooms in the first 2 categories have the interconnecting door that makes a family room. The Standard Rooms (84 beach front, 19 non-beach front) alternate between a twin and double bed setup (ideal for family rooms). Fresh and new, like all the rooms, they have pleasant green and gold furnishings, stone effect floor tiles and a small sitting area partitioned off by a balcony. The bathroom is small but the shower is good. Those that face sunset (the early numbers) also have the good fortune of one of the best sections of beach. The 48 Junior Suites are arranged in closes, or arcs, of rooms with a shared garden in front. The beach in this section almost disappears at high tide, sadly, but the room interiors offer some compensation. The 2-tone yellow and ochre scheme of the sitting room, the solid wood 4-poster with its oatmeal drapes and the overall sense of light, style and privacy definitely lift the spirits. Tea and coffee facilities are always welcome, the tv is best (almost only) seen from the bed, and the white tiled floor gets a bit cold under the air conditioning. Of the 24 Garden Villas inside the island, 12 are in a line along the side of the new swimming pool (these may well become known as Pool Villas). 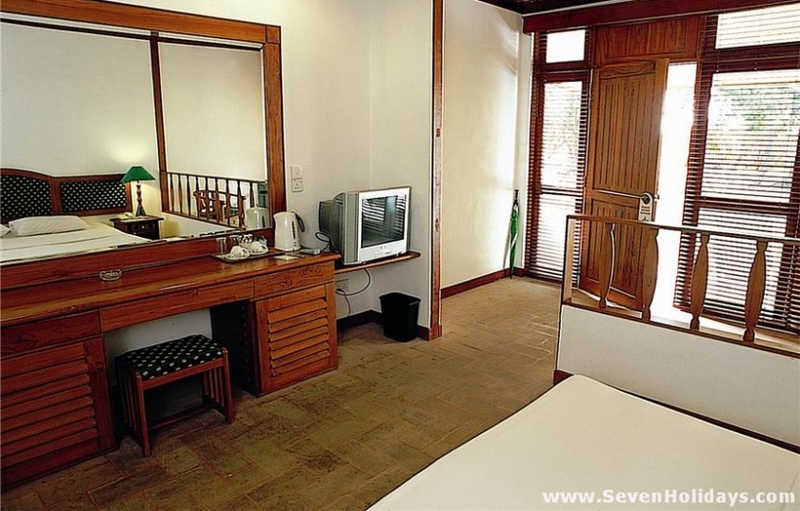 Not as large as the junior suites, they are darker, cosier and have a hint of the East in their decor. Within a short walk of a good beach, their main selling point is the proximity to the pool, with its wide deck, sun loungers and swim-up bar. 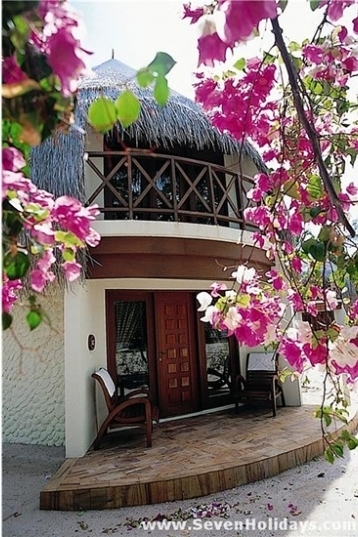 The 48 Beach Villas are the last and greatest of the land rooms to be built. Once the gardens in front of the rooms (in closes) have grown up again the lovely picture will be complete. Each room is a double-storey, circular building with the bedroom upstairs and a little balcony looking out to sea. From the wooden floorboards to the deep orange paint that offsets the earthy colours, these are rooms that give you that little superior feeling. The bathroom only adds to it: half inside and half out, its fittings are very modern and attractive, all the way out to the thatched jacuzzi. The last half of the beach villas have good beach outside but, on the whole, this is one area that is disappointing. 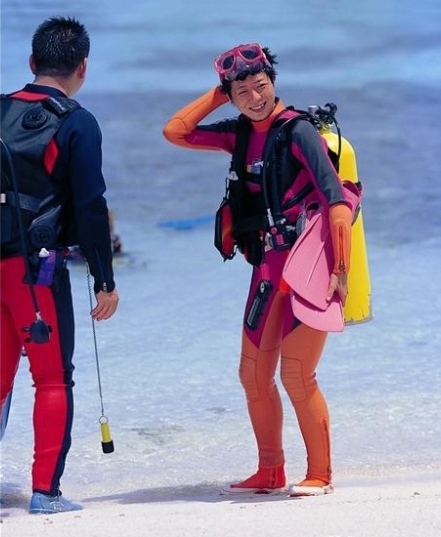 The snorkeling, however, is still good and always close by. One can snorkel all the way around the island or come in via one of the 3 cut-throughs. The dive base is large and impressive. It seems to offer everything from absolute beginner courses up to expert rebreather courses. 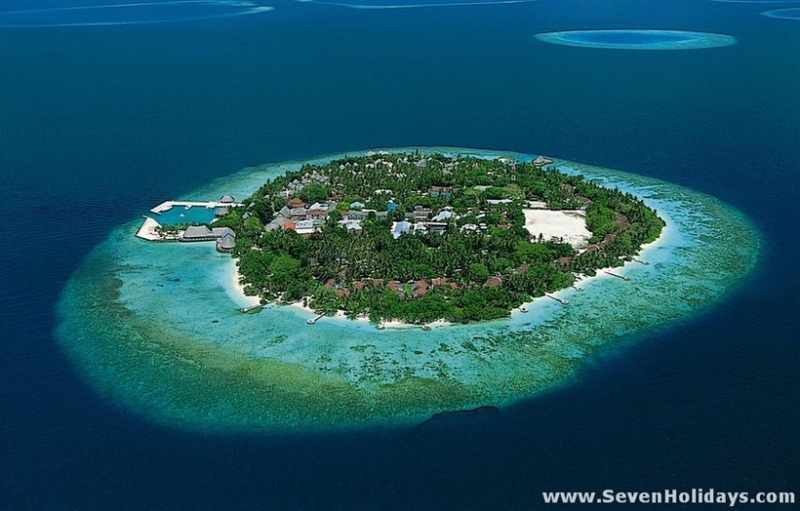 It is a PADI Gold Palm Resort and a Platinum Facility of the International Association of Nitrox and Technical Divers. To cap it all, it has one of the onlydecompression chambers in the country. The main restaurant delivers 3 decent buffets a day though the place itself is rather dark and dull. The fine dining restaurant has sea views but is none too attractive either. The coffee shop and main bar are well placed by the water. The bar is the main focus of nighttime entertainment and this is usually active and buzzing till sometimes very late indeed. All in all, the upgrading is making the regular Bandos guests very happy. 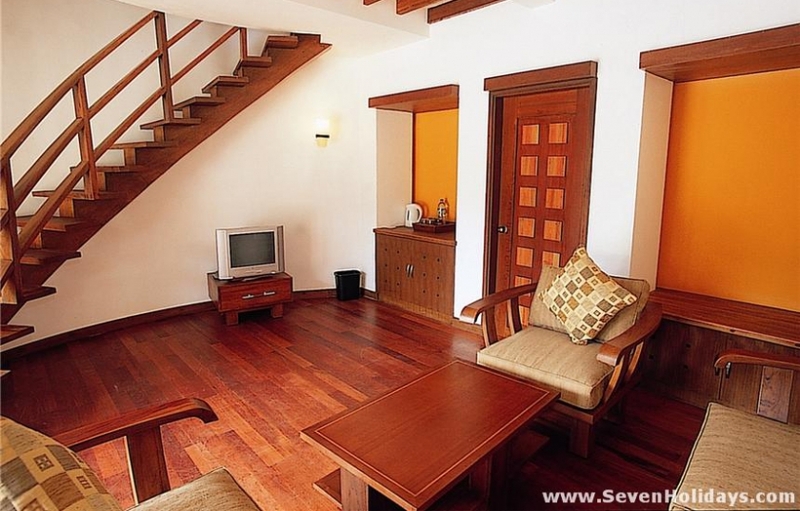 It is the same casual Bandos with that added layer of modern style and facilities.